We are proud of the fact that our juniors make up approx 30% of the total club membership, and with 60 members, ranging in playing abilities and ages, from 5 to 17, it’s always easy to make sure they can be paired up to have even and competitive games. Our club coach, Jon Dann (LTA County Level 4 Coach), plays a major part in their development by running numerous group coaching sessions every week, as well as individual sessions on request, during school term time, from Monday through to Thursday evenings. Then on Saturday mornings and Sunday afternoons we also run match play sessions for the juniors. When the juniors have reached a competent level of play, there are then opportunities to enter LTA tournaments across Surrey, with similar ability players from other clubs. Also, every Summer the club runs junior singles knockout competitions for both the boys and girls. Junior sessions are run all year long during school term times, and its one of the few sports where boys and girls can compete against each other. As a stepping stone to Adult play, we have an Under 22 category membership (for a very small extra fee) which enables the players to attend all the club Mix-in sessions, participate in the Senior’s Knockout Tournaments and also represent the club in Woking League matches. With children wanting to take part in a variety of after school activities and sports, it can prove to be an expensive commitment, and Tennis can be expensive too. But not at Chobham where we offer tremendous value for money. The current annual membership for juniors is only £30 to £40 /year depending on age, and group coaching sessions range from just £3.60 to £4.80 /session, paid on a half-term basis. Catherine Illingworth has run the junior section since 2012. 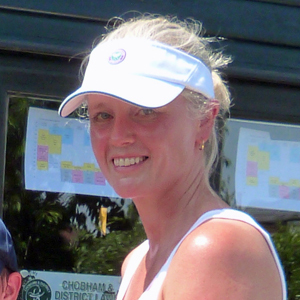 She has been a member of the club since 2005 and 2 of her own children are junior members, so she understands what it takes to make the junior sessions entertaining, so that they keep their interest and enthusiasm and will want to continue playing tennis through to eventually becoming full adult members of our friendly club. What our Junior members have to say about Chobham Tennis Club . . . I started playing tennis in 2012 and have always played at Chobham Tennis Club. I’ve been coming back every week for 6 years because of the community spirit that flows throughout the club, the high-quality training provided by Jon and also the friendships I’ve made with other players here. I enjoy my training sessions every week, as I not only get to play tennis and work on my game, but I also get to socialise with the friends I have made along the way. I first started to “watch” tennis when I was quite young, as my mum especially is a big fan of the sport. Watching Wimbledon was one of the first inspirations of mine to start playing the sport, and more specifically players like Roger Federer and Rafael Nadal also helped to inspire me to pick up the racquet. However, I would say that the first player I truly supported was Jo-Wilfried Tsonga. I still don’t know why to this day, but I must have connected with him in some way. Hopefully I will be able to continue to play tennis for years to come. Rachael Illingworth – Coming soon ! To help juniors ready themselves for competition there are match practice sessions run all year round on Sunday afternoons. These are free to any junior members taking part in coaching and have proved very successful. Players then move on to playing in the Club’s Junior Championships and the twice annual Surrey LTA Postal Tournaments which are an easy first step into playing in events away from the club itself. From there the next step is entering official LTA tournaments and one day match plays. Match plays take place most weekends while the tournaments run through the holiday periods. We are lucky that so many take place within a short drive of the club. The aim of the club has always been to provide enjoyable opportunities for those who are looking for a fun sport\activity which caters for both boys and girls in a friendly and safe environment and which can provide a lifetime of healthy exercise and a useful way in adult life to integrate into a community. At the same time however we hope to offer a pathway for those who wish to challenge themselves a little more. For further details of all the Juniors Tournaments follow the link at the top of this page.